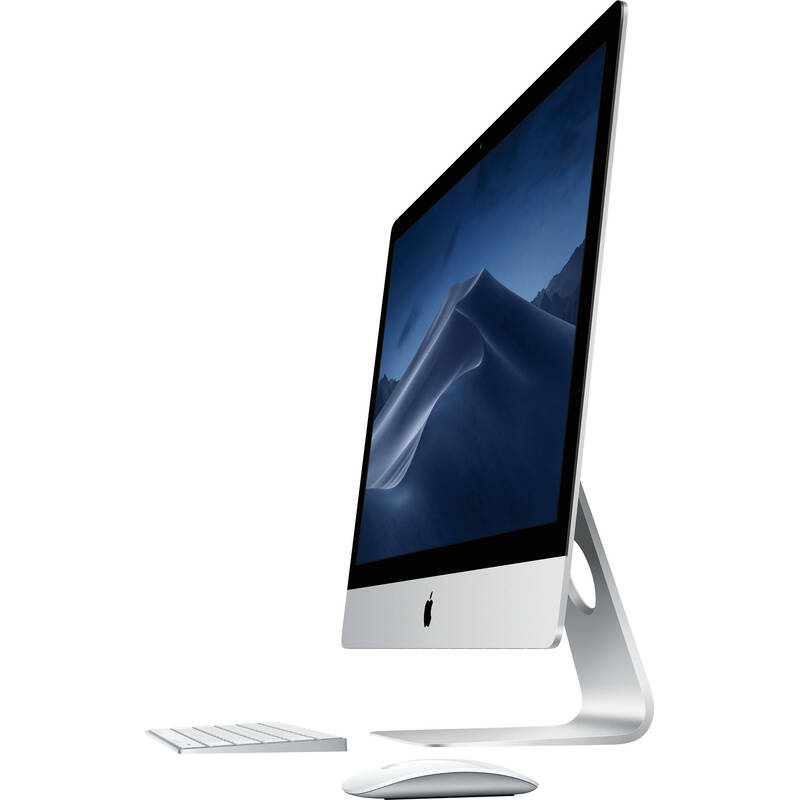 Apple weds high-res 5K visuals into its sleek 27" iMac with Retina 5K Display (Early 2019). With a 5120 x 2880 screen resolution, this iMac provides one billion colors and 500 nits of brightness. The Retina 5K display also features the wider P3 color gamut, which provides a larger color space that shifts away from standard white LEDs to red-green phosphor LEDs that more equally represent red, green, and blue. And with more available colors, the images will appear more vivid and reveal greater detail, with more balance and precision. The iMac's processor has been upgraded and now houses a 9th-gen 3.7 GHz Intel Core i5 Six-Core processor that can be overclocked up to 4.6 GHz, as well as 64GB of 2666 MHz DDR4 RAM. Since 64GB is the maximum amount of memory supported, it cannot be upgraded any further. Visuals are powered by a dedicated AMD Radeon Pro 580X graphics card with 8GB of GDDR5 video memory, and for storage, there is a 2TB Fusion Drive. Outfitted with Wi-Fi 5 (802.11ac) and backwards compatible with 802.11a/b/g/n for speedy hook-ups to your home network, this iMac is also configured with Bluetooth 4.2, as well as an SDXC card slot, two 40 Gb/s Thunderbolt 3 ports, four 5 Gb/s USB 3.0 Type-A ports, a Gigabit Ethernet jack, and a FaceTime HD camera. It also has a Kensington lock slot for added security. Apple's 27" iMac with Retina 5K Display (Early 2019) operates using 100-240 VAC at 50-60 Hz and includes an Apple Magic Keyboard , an Apple Magic Mouse 2, a Lightning to USB Type-A cable, and a power cord. Protection is provided by 90 days of complimentary technical support and a limited 1-year warranty, which can be extended by purchasing AppleCare+ for Mac. Available with a 5K resolution of 5120 x 2880, the Retina display shines beautifully on iMac. With one billion colors and 500 nits of brightness, graphics, text, television shows, and movies are sharp and lifelike, while games also display fine details. This iMac is equipped with a 9th-gen 3.7 GHz Intel Core i5 Six-Core processor and an AMD Radeon Pro 580X graphics card with 8GB of GDDR5 video memory. Storage moves along quickly too, with a 2TB Fusion Drive, so no matter what you're into, you can get it done on your Mac. With a powerful six-core processor, this iMac clocks Turbo Boost speeds up to 4.6 GHz, which means you get more muscle when you're using processor-intensive applications like Logic Pro X or Adobe Photoshop. This iMac features robust AMD Radeon Pro 580X graphics with 8GB of GDDR5 video memory to deliver visual effects and 3D graphics that exhibit raw power in a polished form. Storage is about space, but it's also about speed. A 2TB Fusion Drive gives you the best of both worlds. The apps and files you use the most are automatically stored on fast flash storage, while everything else moves to a high-capacity hard drive. From booting up to launching apps to importing photos, it's faster and more efficient to do it all with Fusion Drive. Your iMac works seamlessly with your iPhone. So whether you're texting, or snapping a photo, you can move between devices without missing a beat. iMac has always stood out in form and function. It is an elegant, quiet, all-in-one computer that puts everything - display, processor, graphics, storage, memory, and more - inside one simple, stylish enclosure. And thanks to its superslim profile, which measures 5mm at its edge, it fits in almost anywhere, yet stands out everywhere. Thunderbolt 3 lets you add one 5K display alongside the one already on your iMac. Or, you can connect two 4K displays and put over 32 million pixels into play.